PHILADELPHIA, PA – November 27, 2017– Janney Montgomery Scott LLC (“Janney”), a leading full-service wealth management, financial services, and investment banking firm headquartered in Philadelphia, PA, announced the hiring of John R. Chase Jr., Senior Vice President/Wealth Management to the firm’s Columbia, SC branch office. Chase, Senior Vice President/ Wealth Management, was previously affiliated with Wells Fargo Advisors. 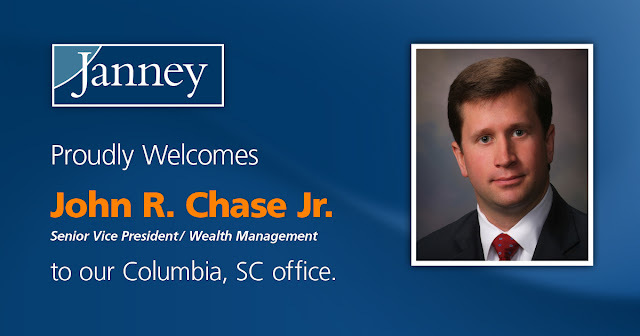 A Certified Financial PlannerTM, Chase is a graduate of The Citadel—The Military College of South Carolina—serving with Distinction as Romeo Company Commander and Senior Class Secretary. He is accompanied at Janney by Ginger S. Allen, Senior Registered Private Client Assistant.